This program is targeted to individuals who have restricted health conditions as well as developmental disabilities. It provides skills development, social interaction, leisure activities, and sensory stimulating activities. 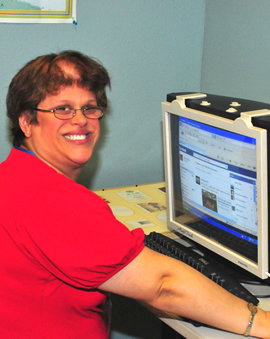 Each component of the program is individualized so that participants with varied physical abilities can participate. Skills development can range from learning to feed themselves to cooking utilizing adaptive technology, while some participants also participate in employment activities such as shredding documents. Many of the participants in this program are nonverbal and communicate through blinks or taps, so staff members spend time each day communicating with them to address emotional needs as well as activities and physical care. Leisure activities include adaptive arts and crafts, music appreciation, reading, games, and community outings. The exercise/sensory stimulation component also varies by client. We offer opportunities for varied physical experiences, such as going into a ball pit, resting on a beanbag, passive range of motion exercises, and ambulation training. The program is provided six hours per day with a staff to participant ratio of 1:1, 2:3, or 1:3. Program staff includes skilled nurses who can ensure that participants’ nursing needs are addressed, including assistance with gastrostomy tube feeding , catheterization, colostomy bags, blood sugar check and insulin administration, seizure management, wound care and medication administration.